In honor of a special blogger's birthday, Michael Lee West from Rattlebridge Farm, I am showing some excerpts of a post that I did in 2011 after reading one of her wonderful books. 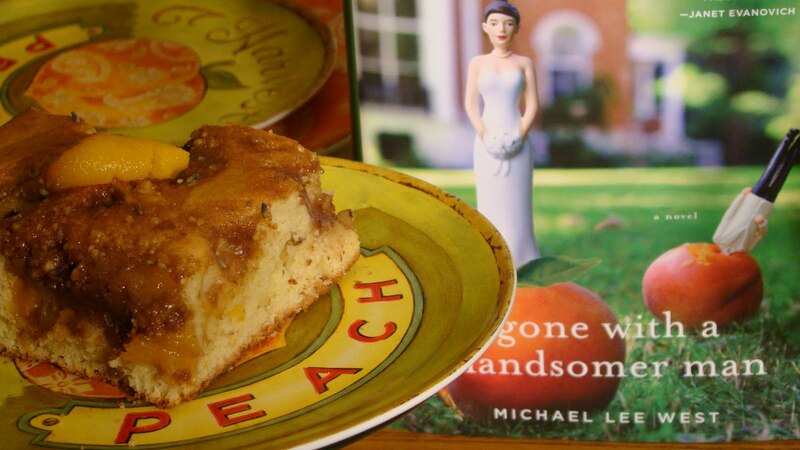 My inspiration for the tablescape was the Vanilla Peach Coffee Cake from Michael Lee West's "Gone With a Handsomer Man". Teeny Templeton, the fictional heroine in the book, loved Vanilla Peach Coffee Cake. This is a wonderful dessert, and I hope you will try it. I sprinkled some dried lavender blossoms on top of the cake while it was baking, and it amplified the floral flavor of the fruit. Beat eggs. Add milk and oil. Whisk. Add vanilla and sour cream. Next, add dry ingredients. Mix. Pour into a greased 9 X 13 inch pan or well-seasoned cast iron skillet. Mix ingredients and spoon over batter. Bake 30 minutes. I also made the birthday girl my favorite cake. 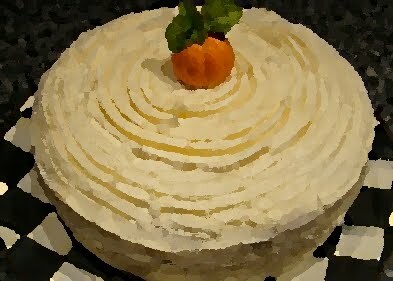 Several years ago, I was searching for a carrot cake recipe that would suit my taste. The requirements were no raisins and no pineapple. Marilyn on the Garden Web shared this recipe, and it is my go to recipe for carrot cake. I prefer layer cakes, but you could also use this recipe to make a sheet cake. combined. Bake 35 to 40 minutes or until wooden pick comes out clean. Cool completely before filling and frosting with 1 recipe Cream Cheese Frosting. Happy 60th Birthday Michael Lee West, the Queen of Southern Novels! Hope you have a fantastic birthday week. I will be joining you on Foodie Friday where we met! Please visit Michael Lee West's friends that are also celebrating today! What a pretty cake. Love that you've used lavender buds. I so enjoyed her lavender series. My mouth started watering as soon as I saw that luscious hunk of peach cake...I made ML's Vanilla Peach Coffee Cake last year & it was scrumptious! Love your pretty peachy place setting & I have serious charger envy going on! Just Lovely! Thanks, too, for the carrot cake recipe. I'll have to compare it to one a friend gave me long ago & see if there is much difference. It is my favorite type of cake! Debbie, I remember Teeny's Vanilla Peach Coffee Cake and your requirements for Carrot Cake would be perfect for us! I don't object to the raisins, but am not wild about the pineapple. It looks delicious and fitting for a foodie Queen and writer! Thanks for joining in the fun~ Happy Birthday Michael Lee West! Ohh, 2 cakes!! Now that's a great way to celebrate! I must try them both! Happy Birthday Michael Lee! loads of bday goodie treats here today and i see we have been harvesting peaches together today! well, thanks to you i even have them~ lovely bday tribute, and of course i am a little extra smitten with the lavender, my new drug of choice! thanks for joining in the celebration, happy birthday michael lee! The perfect cake for Michael Lee to celebrate her birthday! My mouth is watering from looking at your cakes. 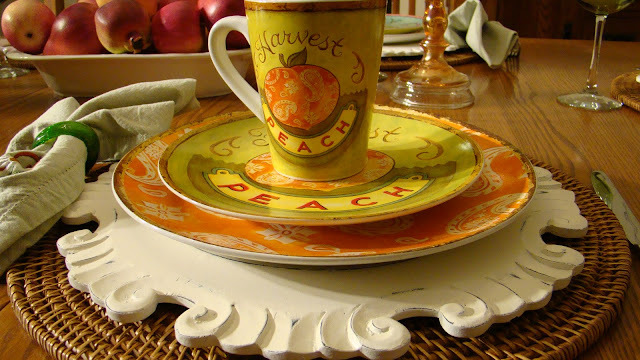 Your tablescape inspiration post is a fitting tribute to MIchael Lee. I have had a ball partying with all you ladies. I love that from her books, that you read about the recipes and the foods and you want to taste them. Then it is fun to try them. You did a beautiful tribute to Michael Lee, happy, happy birthday! I am with you, no raisins and no pineapple (but I would probably leave out the nuts too) I just want melt in your mouth carrot cake - no chewing required! I will be great when I don't have any teeth left, I will just eat melt in your mouth goodies!